"Every civ has a few units that they can upgrade to an extra special degree. For the British, one of those units is the Musketeer (in fact, at the moment, they are the only civ who gets such good Musketeers). If you get this upgrade, the name "Musketeer" is in fact replaced with "Redcoat" -- even if you picked the magenta player color. So they aren't a unique unit in the sense that the French have Musketeers too. But the British Musketeers are nothing to mess with." "Players can send out an explorer to find and negotiate with the Indians, or use the explorer as a sniper, or even have him get captured by the enemy and held for ransom, although why anyone would voluntarily do that is unclear. Itâ€™s also possible to catch the enemyâ€™s explorer as well, but killing him or her is not an option, since they slowly heal themselves. However, after healing enough the explorer will attempt to run away, which makes surrounding him or her with soldiers imperative. If gamers are more of the ransoming type, they can hold on to the hostage until receiving 300 gold pieces from the other player, at which point the explorer returns to camp." ...The Native Americans all speak their correct languages. This was no small feat -- even in some Native American communities the traditional language is not widely spoken. We even got Native American actors to record all of the lines, though we couldn't get representatives from every tribe or nation we represent." This is a time period of startling military diversity. While the Musketeer may form the backbone of a lot of civs' armies (though not at least 3 civs don't even have them), there are lots of other soldiers to use as well. Woah, 3 civilizations won't even feature muskets. If you wish to comment on that, visit Jim lister's forum thread. We'll look into the Dutch "Reiter" issue. It's tough, as you might imagine, to figure out when to use Anglicized words instead of those directly from another language. We didn't do all of the website development in house. So there are probably a few errors. We didn't originally know when we were going to announce the Russians and Ottomans relative to the website going live. We'll get it updated soon. So basically DeathShrimp has confirmed that we'll have a demo yet again (no news), and that issues like the omission of the Ottomans and Russians from the official site and the spelling of the Reiter (Dutch Unit) is being fixed. The biggest news here however, is that ES is planning a worldwide release. That sure is great news for European and Australian folks! If you wish to read DeathShrimp's post and post some questions of your own, visit the Questions Thread. Caesarion has been nice enough to go around google looking for new Age of Empires III videos. He came back with 3, and has shared the links with us, in his forum thread. Hurry up now, one of them even shows campaign footage! The programmers actually provided a parameter to apply an elevation bonus. We've just been to busy to mess with it much lately. We wanted to make sure the unit balance and new formation stuff worked the way we wanted before we started complicating things even more. (Otherwise, while testing, it's hard to tell if you won the fight because of a better formation or HC bonus, or if it was a Bunker Hill situation.) We might very well turn the bonus on before we ship if the other stuff comes together fast enough. Phew, that was a close one. So not to worry dudes and dudettes, elevation bonuses still apply :). "'Nuggets' are the last way to get units. While the thought of nuggets puts me into a craving for processed, breaded chicken, AoE III nuggets are basically little quests found throughout the map you can fulfill to get things like a Native unit or a couple hundred coin. The quests are very straightforward; save a Native being attacked by an exceptionally verile wolf or something else like that. Nuggets aren't tide-turning in gameplay, but they can be useful from time to time." "This one left me rather underwhelmed, especially after the Rise of Legends presentation that I'll let Elysium talk about. The main additions besides the gorgeous graphics and physics engines are the "home cities" and "trading posts". Trading posts are little spots along the trade route you can build next to, and they're built into the map along with the trade route. When you build next to them, you get certain bonuses but everyone can see your building regardless of their explored territory. Sounds okay, but not particularly interesting." Have your own thoughts about the article? Post it in our forums! To paraphrase Tolstoi, "Give me Age of Empires, sir, and you may keep your Warcraft." As one of the industry's three reigning RTS franchises, Age of Empires hardly needs to innovate to maintain its fanbase but that's just what Bruce Shelley and his team at Ensemble have done. Boasting graphics that seem more at home in today's polygon-pushing shooters, Age of Empires III is easily one of the best looking RTS games we've ever seen but the innovations hardly end there. Cool new RPG elements are introduced with the inclusion of a new Home City that you'll develop as a significant resource in your warmaking. The new emphasis on trade routes and commercial development and forging alliances with Native American neighbors makes Age of Empires III about more than just making and moving troops around. Add all that on top of Ensemble's solid RTS mechanics and you'll have an RTS title that's sure to please any fan of the genre. Ensemble tends to give painfully honest demos at E3, while a lot of developers just try and impress the media with overblown promises, AVIs, or other smoke and mirror campaigns. The build of AOE3 we brought to E3 was the real thing. Nothing special turned on or off. You could even play multiplayer, and several people did. That sort of demo is never going to be as exciting as something that is very scripted in order to be more like a movie trailer rather than an actual playable game. But we like to make sure potential customers know what they're going to get. If you wish to also congratulate ES, or are as happy as me and wish to express it, head down to the forums and let it out! Update: It seems that it also won the Best PC Graphics Award, and was a runner up for best PC game. Congrats again! Again, while those are not confirmed 100%, that's about the system you should be looking for to play Age of Empires III on minimum settings. If you still aren't sure your system will play Age3, don't be shy to ask at Genghis Con's thread. Question: When I read that AoE3 uses technology that is not on current graphics cards, I became confused. Is this really true? Because that's bad marketing and I doubt many would go out and buy a new graphic card before the game release. DS: Developers typically work on cards that aren't released to the public yet, because you want your product to work with the most cutting-edge cards when you ship, not three-year old cards. All of this "technology" is bells and whistles -- you can play the game without one of these cards, but the graphics won't look quite as good. To read the rest of DeathShrimp's post or even post a question of your own, visit Angel Sunny's forum thread. In a team meeting Dave Pottinger, lead programmer on the game, commented on how I was having to fully exploit flaws in the AI to beat it, and gave that as proof that it was improving. In fact, the AI stopped making the predictable attacks by the time of the meeting. I was very impressed in more recent games when after beating off a large mixed force attack at the front of my town, the enemy next appeared at the rear of my town where I was least prepared. That was very cool to feel like a clever player was on the other side. I think it'd be cliche for me to say that I can't wait... So I'll let YOU do it at DARK_JOAO's forum thread. :). Looks like new AoE III fansites are getting popular these days; the latest one is AgeFan.com. Good luck, guys! This was actually found 3 days ago, it just sliped our news typing hands :). rpgplanet.com went to E3 and made a huge 28 minutes high resolution video of an E3 presentation of Age3. The camera man asks great questions and shows off some interesting aspects of Age3 (at least the E3 build). The video is hosted at FilePlanet, so grab it now while the lines are still low, then head on down to Caesarion's thread and discuss it! "In honour of our new design, TheColony is hosting a new contest. There are musketmen hidden throughout our new E3 content -- the person that finds them all will receive a Saitek gaming keyboard -- and the runner up a case o' Bawls!" In their coverage of the happenings at E3, GameSpy has put Age of Empires III on its number 16 spot in GS' Annual E3 Awards and gave it the Editor's Choice award. "Every graphical bell and whistle that people normally associate with first-person shooters or fighting games comes into play here: the maps in Age of Empires III look absolutely real. This game is stunningly beautiful and recklessly destructive at the same time. We can't wait to get our hands on this one." "The build of AOE3 we brought to E3 was the real thing. Nothing special turned on or off. You could even play multiplayer, and several people did. That sort of demo is never going to be as exciting as something that is very scripted in order to be more like a movie trailer rather than an actual playable game. But we like to make sure potential customers know what they're going to get." Either way, it's not too shabby; congratulations, ES! In preparation for the release of Age of Empires III, Through The Ages - headed up by SoggyFrog - has reopened with a shiny new layout and new content. Ogre's sites have always done pretty well, so it's definitely a site to keep around your bookmarks. Welcome back, guys! This week's toon made baby Je... Soccy cry. The Author, Rippy took a nice, long, hard working, whole 10 minutes(!!!) to produce this masterpiece that you can find here. We can now start waiting for that to come out. Besides AoE III, the highest voted game in What do you want HG to cover in E3? got Star Wars: EaW, so we tried to get as much information gleaned from the demos shown at E3 as possible. Unfortunately, LucasArts opened their booth only the last 4 hours of the expo, so we weren't able to get a whole lot from it. I absolutely could no find anything on C&C at the convention (spent hours trying to find it, but RoL, Spartan: TW, R&F, and SC: Ghost were all given a run by me, so you'll be seeing info on those games some time this week. Apologies for not getting anything out yet, but traveling plus Real Life has been making things a little difficult for me; I'll try to get everything out by the end of the week, though. (2007) AoE III, you dolt! With all the current E3 reports of AoE III on other sites, surely you've developed more of an opinion on the game. Has E3 made you more excited about AoE III? Answer in our poll! It has been one hell of a week. With the imminent arrival of the E3 gaming expo, new information on AoE III poured infrom all directions. Without a doubt, the best coverage came in the media fans love best - Videos. Videos, videos, videos, it can not be stressed how many AoE III videos were available for download this week. From computer requirements, to new features and even to the game's sound and combat, details on the game has given the community a few surprises. One of which, villager population caps, stirred up quite a heated debate. Outside of E3, the AoE III community has been busy restructuring and reorganizing their respective websites. The most notable, Ensemble Studios' AgeofEmpires3.com, has providedthe community with previously never-before-seen overviews of AoE III's civilizations. Capping the introduction of 'AgeofEmpires3.com,' both AoE III fansites Through The Ages, and The Colony have gone through extensive, yet attractive redesigns. What can you expect next week? Well, with the return of the HG crew from their trip to E3, we will finally be able to see what they've been up to this past week. Could this mean additional news and info on AoE III? Most certainly! From what has been said, expect exceptionally detailed notes and tons of high quality photos from the event. That's it for this week. See you on the battlefield. EBGames has recently added a new addition to it's Age of Empires III page - box art. While it hasn't been officially stated whetherthis box art is the box art that will be used for the game, the fact that it was posted on one of the leading retail gaming outlets is agood indication that it very well could be. Judging by the latest reaction from fans, the mixture of styles from previous ES games with an entirely new facelift is a positive, if notwelcome design. War! It's everywhere! From Gamespot to Justgamers, to even MTV, E3 footage has been documenting and describingall aspects of warfare in AoE III. May it be the destruction of a ship on its maiden voyage, or a surprise attack on a German village, the videos have shown an amazing glimpse into the interactivity within the game. What is interesting to note, despitethe tactical formations and the epic use of Havok, is the orchestrated soundtrack and the GUI - which is quite... different to previous games in the Ageof Empires series. Considering E3 has officially ended, it will be interesting to see what info is released in the next few days. So far, it's looking up. "There is an overall villager cap in the game, and it appears the most basic number is 100, half of your total population (more considering cannons and other units can take up more then one spot). However, due to the differences between Settlers from civilization to civilization, not all villager caps are created equal. Germans are capped at 40, the French are capped at 60, the Dutch are capped somewhere unique as well, same with the Ottomans, and perhaps other civilizations too have different values." Ah, well perhaps that will quell some of the fears in regards to the population limits. It is interesting to note, however, that ES has previously stated that playtesters tend to not reach the population caps in most of their games. IGN has posted 6 top-notch recorded videos of footage taken at the AoE III booth at E3. The videos, each about a minute long, showcase AoE III's Havok engine, combat, hunting and even a glimpse at the innerworkings behind the Home City. While they may be a tad bit shorter than what would be liked (Hey, atleast it's a video, not just a screenshot), ES has pulled through and created a game which is, by far, exhilarating for the eyes. "In the third age you can build Plantations, an infinite but slow source of gold that can hold 10 villagers at a time. And of course there are the mills, which replace farms from previous games. Mills hold 10 villies and are an infinite source of food. Currently in the multiplayer build, at least for the Germans, there appeared to be no third age Fortress building, similiar to Castles etc from previous games. Of course, the Third Age is called the Fortress Age, and an ES employee told me that they should be in the game." 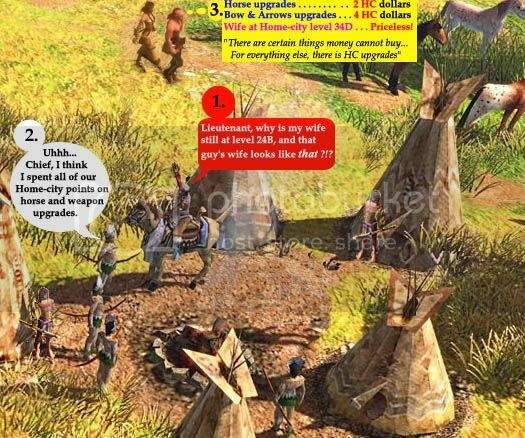 For those who have played Age of Mythology, from the article it appears that Plantations and Mills may work similarly to the Temples or to the Vault of Plenty; although, in this case it requires villagers... and less Hephaestus. "As we've mentioned in our previous coverage, ordering large groups of soldiers to attack single targets will cause them to automatically attempt to flank them. Facing will be a more important concern than in previous games, since flanking and rear attacks will be especially effective." Could this, among other new tactics, help encourage a greater diversity of strategies on the battlefield? It can be assumed that warfare in AoE III will be well evolved. Whether it's a good or bad improvement, why not stop by and give your thoughts in Ajs77311's thread? "T-Shirts: The front has the AoE III Logo on it; I'll take a picture of the back sometime tomorrow, but basically it has a sword stuck onto the side of the earth with an extreme perspective on it, with the words "Claim it." above it"
Claim it? Well, you've got to admit it's better than 'Just do it.' Although, From the sounds of it, the notes do give the impression that the AoE III booth is the place to be at E3. "He [Bruce Shelly] said, a machine that played AoM well should be able to play AoE3 also. The specs to run it well shouldn't be too high"
"There is actually stuff we have made in this game that you can't see yet on video cards that exist." Holy smokes! This probably means that you might only see the game on it's full glory in a few years, that's pretty cool if you ask me! "For the next six months or so, Age of Empires III will understandably dominate the blog. That is the most important and most public thing we are doing right now. We follow the discussions on fan sites, thanks to Ben Donges, who monitors those for us, and this may be a venue for responding when questions are really burning or discussions get way off track." "You'll find definite personalities and tactical tendencies among the AI opponents as well. Ivan is a relentless attacker (much like our own Ivan), while Elizabeth is more cooperative and agreeable to alliances. We were pleased to hear that the game will include a new taunting system somewhat similar to the one used in C&C Generals. If you find yourself playing against Napoleon for instance, he may tell you that he's discovered a weakness in your defenses just before sending in a wave of soldiers to exploit that weakness. This kind of personality really helps add a sense of life to your opponents." A smarter and more 'human' AI? Definitely, yet another aspect of AoE III to look forward to. As the start of E3 coverage on AoE3, it's certainly promising to be quite a week. A few weeks back we recieved great feedback from our request for Age of Empires III toons. Our forummers showed off their photoshop skillz and pulled off things that made my dog laugh. To start things off again, I'll feature 3 at a time on the news. First one was posted by SuperTroopers[DK4U], and it's about something that should be quite obvious, yet I had never noticed... (dang asian vampires). Our second feature is a toon by Steel_Cat, and possibly an overpowered AoE3 unit. Finally, in our last featured toon Alexandergreat3 tells us how to better spend our Home City upgrades, and perhaps how to better spend your real life resources :). I hope you liked those, our toons will be posted every tuesday (skipping tomorrow), be ready to laugh your fake teeth off! "I know the Swedes have more right (whatever that means) than the Germans or Ottomans to be in the game, but when we started to think about the Swedish units and what the Swedes would do, we realized they weren't going to feel nearly as different from civs like the Dutch and French as other civs would." But what is of the most concern is his mentioning that they may be added in the Xpack. Good news for Swede supporters! "Like I said before, maybe in an Xpack. I'd love to see Stockholm as a Home City." Never hit the pop cap? While he was answering a question about Ottoman settler spawning, DeathShrimp said that people rarely hit their population cap in games. Whether it's because the cap is rediculously high or combat is "pretty lethal" as DS actually says, it'll be awesome either way. "DS: The Ottomans hit peaks periodically. You can stop production then, or you can go for more. I don't think I've ever been mad at my Settlers for continually spawning. In fact, it's worth pointing out that we rarely hit the pop cap at all (e.g. I couldn't even tell you what it is at the moment). I think it's because combat is pretty lethal so you're often replacing troops." GameSpot has a video interview with Bruce Shelly about AoE III; the interview doesn't really cover anything new, which I suppose is being held until E3. In their preparation for E3, IGN has made a list of the 5 games that they're anticipating at E3 more than any other. Age of Empires III got the number 2 spot just behind Battlefield 2, nohing to scoff at by any means. I'm clearly anticipating it the most, and you'll get the coverage to verify that. Thanks to PAoM for this news bit! "One of the best selling and most popular franchises in PC history belongs to Microsoft and Ensemble Studios. The Age of Empires series has set the bar for historically based RTS games for years and years and their latest, Age of Empires III looks to do the same. Moving out of Europe and the Middle-ages and into the New World has created whole new challenges for the development crew. But judging by what we've seen so far, they're well up to the task. We can't wait to get another look at the game and it's promise of a new visual frontier in RTS titles." 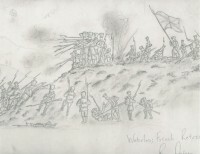 Bravinsky, the 2nd place winner in our Fan Art Contest, as submitted a new drawing, this time of two infantrymen. It's just as well done as his last submission; if you'd like to submit some art yourself, just send it my way! But it is a new fansite for AoE III. http://www.xamolxis.com/AOE3/Index.php, check it out! Ottomans, Brits, French, oh my! Do you like the selection of civilizations in AoE III? Most of you all do, though there still is a percentage that isn't happy with the civs that are in the game, probably most notably the Ottomans, which have been getting some naysayers these days. Either way, I'm thinking they will be fun to play, being completely different from all of the European civs. Next week, I - along with the rest of the Halo group at HG - will be going to E3 to check things out and report on the top games in our visitors' minds. So we kinda need to know which ones those are. What do you want HG to cover in E3? The list I've got right now are all of the main RTS or RTS-related games that will be shown at E3, but you're free to suggest more in the forum thread! "DS: Yes. That's the idea. The HC doesn't replace your economy. It just enhances it. Before, the only goal of an early attack was to set your opponent so far back that you could somehow leapfrog their economy and get a bigger army in later Ages. You can still do that, though it's harder. But you can attack someone and do moderate damage, but benefit from the experience (literally). Having a great New World econ is still useful, but most resources gathered doesn't have as tight a correlation to who won the game as our previous games." "DS: Villagers are very expensive in AOE3. They actually cost what they are worth. Losing a few to a raid can be devastating." The Ottomans - the most often talked about civ in AoE III nowadays - have a unique advantage in creating villagers: it's free. However, as DeathShrimp has explained in The AoE3 Question Thread, it seems that settlers are slowly spawned without any sort of control by the player. This lack of control could spell disaster if they're needing to rebuild a decimated settler population after a rush or something like that; conversely, it could be the advantage that would let Ottomans devote all their resources into early military to allow them to crush their opponents in an early rush. Interesting! On the Ottomans -- they are tricky to play. The way it works currently is they *slowly* spew out Settlers. So you don't have to pay for them, but you can't control their rate either. At some number the Settlers stop, at which point you have to build a Mosque and get some improvements to get the Settler production to continue. It's a weird vibe. Ottomans have to be very careful not to lose early Settlers to a rush, and they really have to protect that Mosque. But it also means that if you want to rush as Ottomans, you can spend all of your resources on troops, as well as your HC shipments (Ottomans can't send Settlers from Constantinople either). With confusing acronyms and terms flying around everywhere - FFA, HC, RTS...STD - talking about AoE III can be a little confusing. To help alleviate the pain, AoEHolland has a dictionary for everyone's benefit. It's not exceptionally long now, but I'm thinking as we find out more about the game, it'll expand some. Thanks guys! One of AoE III's newest fansites, AoE3.ne1.net is running a comic strip contest. The winner will get both Half-life 2 and Matrix Online with the runners up getting $15 vouchers for Ebay, so it's definitely enough incentive to try to make the funniest or most clever comic strips and sending them in. Good luck to everyone! "The task is simple; design a comic strip related to Age3. Whether you use images online, or create your on at Painshot Pro, is really upto you. The prize (Half-life 2 and the Matrix Online for PC) will be awarded to the best individual's creativity, and 2 runners up will also receive a $15 voucher off at ebay.com"
"And in addition to all these new features, Age of Empires III will feature a powerful all-new graphics engine that models highly detailed environments and units. Spanish frigates are appropriately huge and sway with the tides at sea, while home cities bustle with townspeople, and soldiers charge into battle until they're cut down by cannon fire and musket fusillades that discharge with plumes of white smoke. " A new fansite has started from Sweden: AgeofEmpires.se. I really couldn't say much on it because I haven't practiced my swedish recently, but I guess you can take a look if you're of the Swede persuasion. Enjoy. ...Ensemble is fortunate that we never hire to fill a slot. We hire someone who matches up well against what we need, but it's more important that we find someone who fits into how we work, our culture, etc. So whether you come in with X+1 or X-1 training is less critical than whether or not you can tell me something cogent and thoughtful when I ask you "So, what's the worst thing about AOM?"." What do you want in DeathMatch? "DM is worth discussing, because it isn't finished yet. Since not many of us are DM'ers we want to make sure we deliver what it is fans want." It may be a little too late to get any major change in regular gameplay, but you just might make a suggestion that gets into AoE III's DeathMatch. Discuss! GameSpy released the official list of the civilizations last week, including a brief description of each. Do you like the selection of civilizations in AoE III? Answer in our poll! What a week! The biggest news for this week must be, without a doubt, Gamespy's exclusive hands-on coverage of AoE III. Spanning four days, Gamespy has released five articles and five screenshots which have helped retain the image that AoE III will be one spectacular game. Characterizing the civilizations, strategy tactics, the ages, and the design process, each article has produced quite a few surprises, including the much talked aboutFifth Age. Yet, that can't be all? Certainly not! Around each article, the developers of AoE III have been busy answering questions and giving hints in the forums. From the origins of Ensemble Studios, to reiterations on drop-off points, new information seems to be everywhere these days - Even the game's release date has been unofficially (more or less) pinned down to November 1st! What can you expect next week? Well, there have been some hints of an AoE III video coming soon, but whether soon is sooner or later, your guess is as good as mine. Whatis certain is that Soccy will be returning to AoE3H from his weeklong trip, and the content of AoE3H will be going through a much needed update. Oh, yes. "Hence, the Fifth Age. You can try to leverage your super-powered economy into an attempt to get even better upgrades and try to shut down the game. It's a risk though. While going up to Age3 and Age4 is nearly always a good thing, it's possible to go up to Age5 too soon. All of the Age5 upgrades, while crazy good, are also very expensive. You need a lot of villagers and can't be worried about resources running out soon. I've been in a few games where I wish I could take back my decision to go to Age5 and spend the money on more soldiers instead." Judging by his response, the importance of the Fifth Age may have been exaggerated. Yet, as an initiative to reach in longer games, it will allow for much more excitement if a game begins to get dry. Russians, Germans, Ottomans, Oh My! "Much as you can build farms to generate 'free' food, the Dutch will have the ability to build banks that can generate free money. On maps where players are scrounging for gold this can make a big difference. No word yet on whether or not the Dutch can buy Manhattan for a handful of beads." Ah, if only real banks gave out free gold, I wouldn't have to worry about student loans. Those lucky Dutch!